Dwarf psychology has always been a particular strength in the story-making machinery; good to see further iteration and a bit more said about the roadmap! Hooray new DF update! This one lets you interact with the hill forts and villages surrounding your fortress. If I remember right, this is the last major update before Toady starts working on the magic system - which I'm very excited about. Then, after the magic/mythology update, I believe he said that boats were next up on the agenda, and multi-tile creatures. That will be interesting. Toady One wrote: There are now peaceful and not-so-peaceful ways of expanding your influence in the world. Once a site becomes linked to you (through prosperity or by conquest; you'll see a message), you can send a messenger there to request workers, or send dwarves from the fort out to such sites (from v-p). This only works on historical figures, so you might find you don't have off-site workers available at first, though some sites do have them. This release should also improve the issues dwarves were having with negative thoughts, and they can also now experience permanent changes in their personalities and intellectual values due to events in their lives. Toady's devlogs are excellent as usual (although I'm almost a month late with this one). Toady One wrote: This week involved a lot of bug-fixing from last week, so there's not as much concrete progress to report. For instance, a human trading company called the Present Hall was wildly successful trading various leathers and bones for crafting, and eventually had enough clout to open a branch warehouse inside a dwarf fortress for the first time. Can't resist that draltha leather. This turned out to be a strategic error, as two short years later, a forgotten beast obliterated the fortress, the warehouse, and killed everyone inside. So, what's the correct response? Close the destroyed branch? No, no, you stimulate the (non-existent) economy by hiring local. Forgotten beast, you're the new (ruined) warehouse administrator, congratulations! 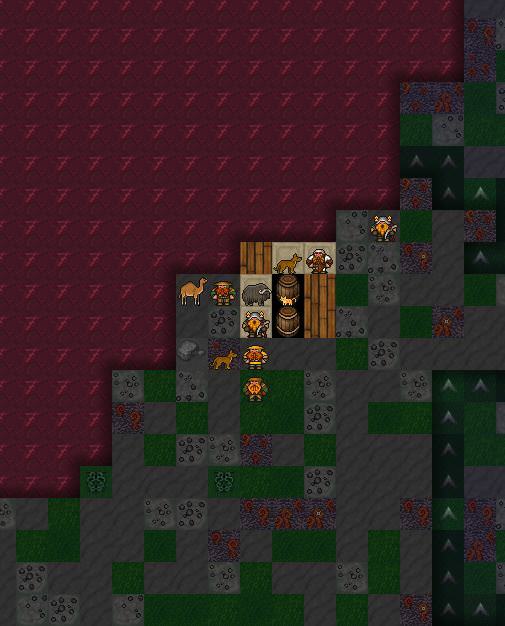 That is a lovely embark spot and I envy you the creations you've likely built with it. There's usually clean water in the caverns, if you dare to dig that deep.